The Red-sided Eclectus (Eclectus roratus polychloros) - also known as New Guinea Eclectus Parrot - is one of the most popular parrot species kept by aviculturists and one big reason is their spectacular, bright-colored plumage and gentle, friendly personalities. The Red-sided Eclectus is the most common of the nine Eclectus subspecies, both in captivity and in the wild. This species was also introduced to the island of Koror and some smaller islands in the Palau group in the Pacific. Even though generally quiet, these parrots have very loud, shrill calls, which can be heard when they are excited or alarmed, or when trying to make contact with their family (which could be a family member, another bird, etc.). They may not be the right pet for those sensitive to noise. plenty of out-of-cage activities to prevent boredom and depression. If their needs are not met, these intelligent creatures can develop serious behavioral problems. Eclectus parrots are among the top three "talking" parrots. 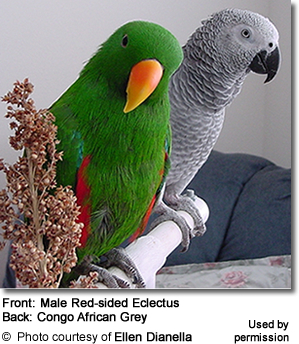 They rival the talented African Grey and Amazon parrots in terms of clarity of speech and vocabulary. Some even learned entire songs. 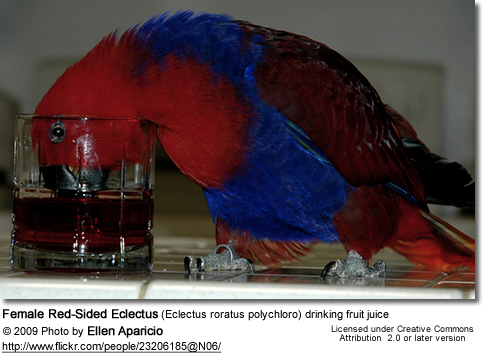 Eclectuses usually have sweet, female or childlike voices. Even though the talent varies, most Eclectus do learn at least a few words. Eclectus parrots are not as playful as other parrots. They are usually content just chewing on wood toys or leather strips; or shredding paper crumbled up into a ball. One cheap, yet favorite, "foraging toy" is an phone book hanging down from the top of their cage, making for many hours of entertainment for these birds. One of the biggest ownership problems occurs when they reach maturity at about age 3. Females in particular may choose a location either in or outside of her cage for nesting, and will aggressively protect it, even against her owner. Once the nesting period is over, she will usually be her sweet and gentle self. 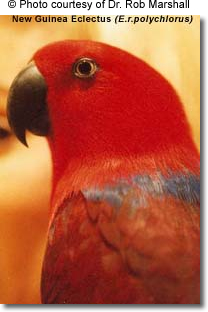 However, hormonal aggression is not an experience that all Eclectus owners have with their pets. Some describe that even though the Eclectus hen will lay an egg or two, she remains gentle and sweet, and may even invite their favorite human to "nest" with her. They usually live up to 30 - 40 years, but there is no reason why they can't live 50 to 75 years like other parrots of comparable size - provided good nutrition and care is provided. They gain maturity when they are about 3 years old. The most common health problem of these parrots is associated with malnutrition (including feather picking and respiratory infections) as they need a higher percentage of fruits in their die compared to other parrots. The most common vitamin deficiency is Vitamin A, and they need a good amount of produce that is rich in this vitamin, such as carrots, squash, broccoli, kale and cooked sweet potatoes. 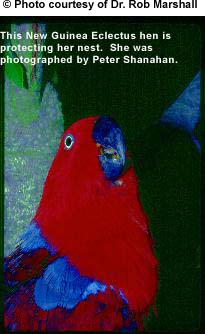 Joseph M. Forshaw in "Parrots of the World" wrote, "Eclectus Parrots feed on fruits, nuts, seeds, berries, leaf buds, blossoms and nectar procured in the treetops." For good health, a healthy captive diet should be as close to their natural diet as possible. As fresh produce is expensive and messy, bird owners resorted to Vitamin enriched dry foods (seeds, pellets) with mostly synthetic vitamins. This has contributed to common Eclectus-specific problems, such as "toe tapping" - a condition where the toes repetitively extend and contract. Once the synthetic vitamins were discontinued, this problem usually resolves. It is most commonly recommended to provide nutrition via fresh produce instead of processed foods (including Vitamin-enriched seeds / pellets and vitamin supplements). Synthetic vitamins can also cause toxicities. So it is best to discuss with your avian veterinarian before adding supplements or processed foods to your Eclectus's diet. They are medium-sized parrots, averaging 14 inches or 35 cm in length (including the tail) and weigh between 16 - 19 oz (470 – 525 grams). The Red-sided Eclectus is slightly larger than the Grand Eclectus, slightly smaller than the Vosmaeri Eclectus, and considerably larger than the Solomon Island Eclectus. 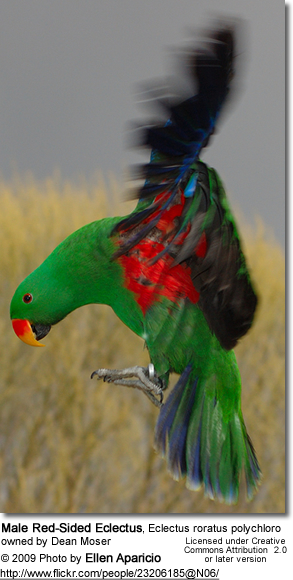 The male Red-sided Eclectus Parrots have green feathering over most of their bodies. Their primary wing-coverts and primary flight feathers are blue, edged in green. The tips of the tail feathers are yellow. The underside of the tail is black, except for the yellow tip. The iris is reddish orange. 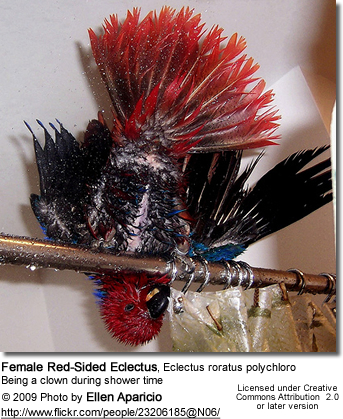 The female Red-sided Eclectus Parrots are mostly red with dark blue underwing coverts. Their primary coverts are blue, edged with green. The tips of their red tails have pale edging, and their irises are a light, yellow-white color. Female Red-sided Eclectus Parrots tend to have bright, scarlet heads with a duller, deeper, maroon shading over their backs.